Bush House Gig, Mt Kembla. 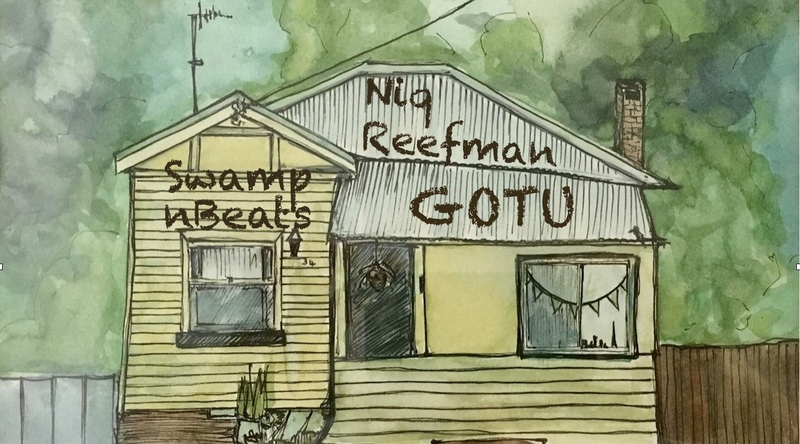 The bush house gig is on again for an intimate interlude of delectable musical delights with Niq Reefman, GOTU and Swamp n Beats. NOTE THAT THIS IS A GIG IN MT. KEMBLA- THE LOCATION WILL BE CONFIRMED ON PURCHASE. The rainforest vibes will come alive with stories to share and melodic musings wafting through the fresh evening air. Bring a plate, bring refreshments and bring good cheer to share. His name translates to “Victory for the people”, and he brings songs of beauty, mirth, camaraderie, inspiration and action to a world that craves the social zest of an Irish pub and the hopeful melodies of nature. Born on the South Coast of NSW Australia, GOTU has crafted their own unique sound featuring steel string guitar, nylon guitar, violin, djembe, Native American flute and didgeridoo. Their inspiration comes from a wide range of musical styles from classical violin and guitar, to 1970’s psychedelic rock and blues, creating a raw earthy flowing sound fuelled by the soul, for you find yourself lost amongst. Described as “having a voice carved from a tree” Damion has been branching out from being a percussionist. His song writing was triggered by a trip to the jungles of Ecuador where he worked with a Quechua Indian family and scored a handmade Ecuadorian Cedar guitar. Songs about family, community, nature and making the most of what “This Day” has to offer theme his original Indy Folk Blues with an Afro Twist.